It’s that time of year again. Mrs. N=1 and I are on the 2014 Low-Carb Cruise. 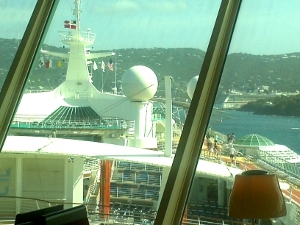 The photo to the left shows the approach to St. Thomas from the Viking Crown lounge on deck 14 aft on the RCL Freedom of the Seas. The photo is linked to my wife’s book on how to get the most out of your cruise vacation. I have mentioned previously that cruising is our favorite form of vacation. This is our 3rd cruise this year. But it’s the first time we have been to the Eastern Caribbean. As usual, I’m experimenting with some variations in diet. On this cruise, I’m experimenting with eating a bit less, and I have a supply of Dave Asprey’s Upgraded Coffee, which I am preparing “sort of” Bulletproof-style. Which is to say, MCT oil is a bit challenging to pack and use (if you used MCT for pretty much anything, you know what I mean), so I left that at home, and brought coconut oil instead. To pack the coconut oil, I chilled it in the refrigerator, and packed the jar in a separate ziplock bag. Coconut oil contains a bit of MCT. Not a huge percentage, but enough that on a low-carb diet, it does boost the ketones enough to notice. Unfortunately, I haven’t been able to find any grass-fed butter, so I have been using the ship’s (salted) butter. It’s a little odd-tasting, but I don’t drink it for the taste. I look forward to getting back, though, so I can prepare it in my normal fashion. Dave Asprey has a contest running for best video on the process of preparing Bulletproof Coffee, and I hope to be able to enter that, with a slightly different wrinkle (stay tuned). This has already been a highly-productive working vacation. In addition to bringing my best violin to practice for the upcoming NTSO season finale concert, I brought my good camera to capture some video interviews with some of the celebrities on the cruise, like I did last year. I’ve gotten four really good interviews, and I’m hoping to get as many as four more. That will keep me busy for the month or so after I get back home. I’m going to make a sincere effort to post all of my videos by the end of June. My next post will go into some detail on my current N=1 experiment, which spans this and the previous cruise. This entry was posted in Diet, Low Carb Cruising!. Bookmark the permalink.